Tomorrow morning I will hand my baby girl over to a team of doctors and nurses who will take her into a big, scary, sterile OR and give her anestesia. 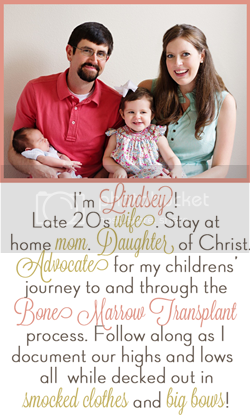 They will then shove a needle into her little bone to biopsy her bone marrow. I've asked myself why. I've cried. I've been angry. I'm not scared for myself. I'm scared for Kate. What if she is scared in the OR? What if she feels abandoned? What if she has to go through horrible treatment to get well? Why is my perfect, sweet, amazing baby girl facing this? If I could have this sickness, and go through all of this for her, I would. I would do anything so she does not feel pain. The only thing comforting me (other than my sweet husband) is knowing that I worship a God of miracles. The ultimate Healer. He will be with us tomorrow - and through whatever journey we have to face to get Kate well. Sitting Up Like a Big Girl!!! Kate's New Ride & New Tricks! Be Mine: Pear Tree Greetings Giveaway! Hanging out with the Fishies!